Interviews – Composer and video game soundtrack star Jesper Kyd tells all, Swedish maestro Jonas Rathsman talks about his career and simplifying his studio and Bowie and Wham! engineer Chris Porter wows us with his amazing career. 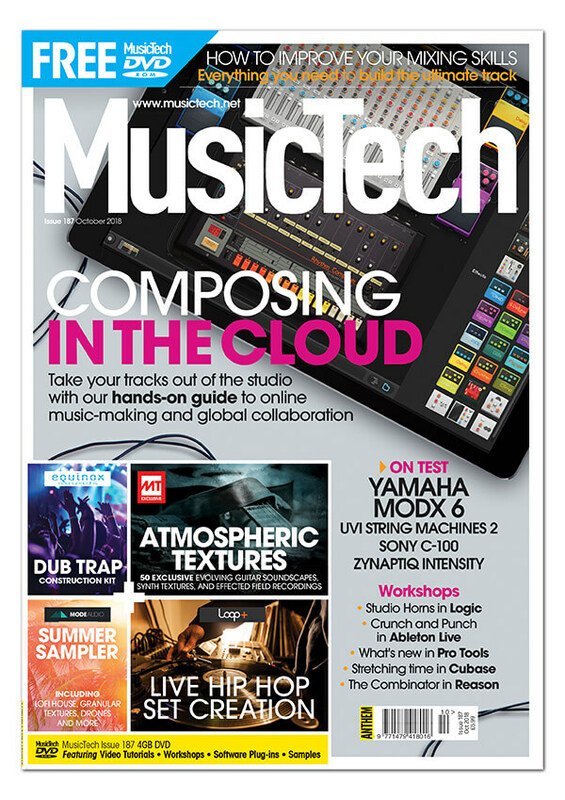 Tutorials – Mark Cousins polishes his brass in his Studio Horns Logic tutorial, Martin Delaney explores the new Drum Buss’s dirty side in Live, Adam Crute digs into the options in part 2 of his time and pitch tutorial in Cubase, Mike Hillier looks at the new features of Pro Tools 2018 and Andy Jones continues his exploration of Reason’s sound design possibilities. Reviews – We review the new Yamaha MODX 6, Sony C-100, Kali Audio LP-6, Audio Imperia Jaeger Essential Modern Orchestra, Vox Continental, Warm Audio WA-412, Zynaptiq Intensity, UVI String Machines and more. DVD – 4GB of videos, workshop, plug-ins and samples including Dub Trap Construction Kits, Atmospheric Textures, Summer Sampler and Live Hip Hop Set Creation.